I have read that Zcash is a "trusted" system and that Monero is "trustless". As they are both open source projects, what is the difference. What makes Monero "trustless"? Both systems are trustless in regards using the cryptocurrency (note that Zcash still lacks enough peer-review compared to Monero so major bugs could exist), the trusted and worrying factor in Zcash, which Monero doesn't suffer, is that you have to trust that the Zcash team is able to properly setup and dispose the so called "SNARK public parameters" that produces a kind of cryptographic "toxic waste" which could make Zcash counterfeitable. Trustless means that you don't have to rely on a trusted party to say whether a given piece of information is correct (like your balance) or if a signature is valid. The way you trust a bank to correctly account your balance, for example. With blockchain-based cryptocurrency, anyone can indenpendently verify what goes on (the nodes of the network are doing exactly that, all the time), and the signatures are cryptographically proven. That's why we call such currencies trustless. From the above, we can assert that both Zcash and Monero are trustless. However, there's one catch with Zcash - it requires a trusted setup. Without going too much in detail, a number of individuals will set up the system initially by randomly generating some data, after which they're trusted to permanently destroy the generated data. Failure to do so could enable an adversary to get this data which would give him the power to counterfeit as many Zcash as he likes, without it ever being directly detected! 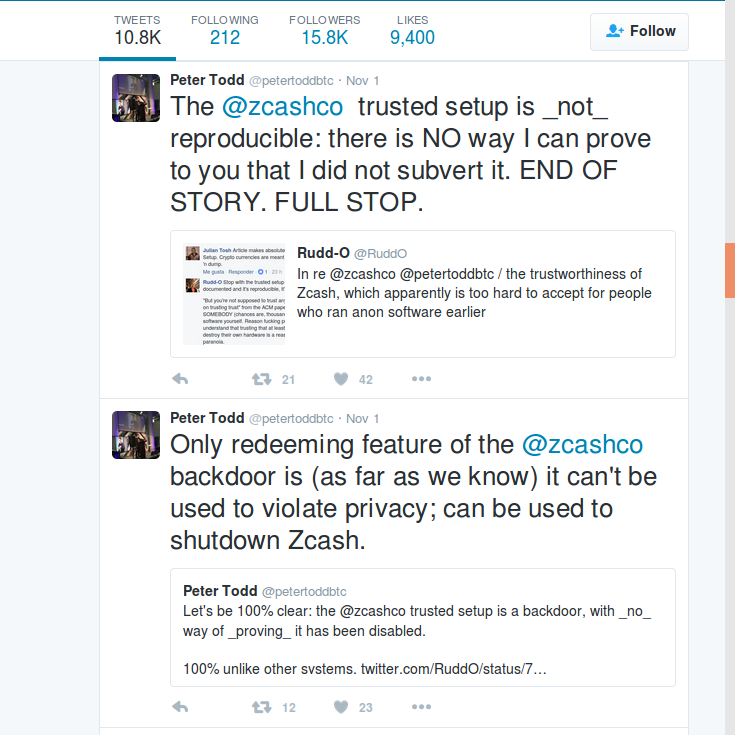 So, Zcash would be trustless as long as the set-up went through without compromise. Considering that the set-up itself is not trustless I'm not sure if we can ever call Zcash trustless, as it depends on someone not having a piece of information. We could speculate on the chances of it being compromised, but in the end, there's no way to prove with 0-knowledge that it was not. Not the answer you're looking for? Browse other questions tagged cryptocurrency-comparison zcash zk-snarks trustless-system or ask your own question.